In his round-up of 2003 round-ups, Angus wondered out loud as to why I'd included the Richard X album in my highlights of 2003. Isn't this everything k-punk should hate, he asked? Surely Richard X is the kind of self-conscious meta-pop I'm pledged to destroy? Richard X represents a postmodernist modernism, or modernist postmodernism, in which what is revived is modernism's very hunger for novelty itself. The Numan and Human League which Richard X retools and refits were the last gasps of modernism in Pop, before the spiralling temporality (nothing is new, everything is forgiven) of PoMo clicked in. All of which brings to mind Simon's (relatively) recent comments (inspired by rant against Daft Punk *) on the possibility of irony and awe co-existing. The strange thing is, I'd never thought of Daft Punk as especially detached. I'd assumed almost the opposite: that it was genuine enthusiasm for Supertramp, 10cc, ELO and Wings that inspired them into breaking ranks with accepted taste and simulating their sound on Discovery. I wonder if there's something about electronic music which lends itself to producing this problematic, though? The original awe-inspiring ironists would be Kraftwerk, they who made detachment into an art form, yet whose sound was gleamingly awe-some. Two other examples: The Pet Shop Boys (eyebrows raised but achingly melancholic) and Yello (aristocratically detached, but capable of swooning majesty). Love it! But I do like Jimmy Carr. And if ciabatta is ubiquitous, all well and good, as far as I am concerned. Aaah the ciabatta question. The first time you saw it on the sandwich shop menu, maybe six years ago, it was seductive, the syllables as bouncy and delicate as the air-sprung loaf. Naturally you ordered and were drawn into the novelty of bread that yeilded slowly, rather than crunched or wilted with the first wave of saliva. However, I discovered recently that I had perhaps turned my back on the humble baguette too quickly. 'No, no ciabatta today, especially not the honey and malt variety. Sold out hours ago. We've got baguettes left though.' And so I compromised. The thin layers of parma ham were ruffled into a new-romantic shirt of a sandwich. And what nostalgia assaulted me with that first bite! Rediscovery, is it not every bit as thrilling as the new? yeah yeah yeah! k-punk is BACK. Praise the lord. Ciabatta is hell on those of us with bad teeth, but I can't bring myself to blame Daft Punk for that. Actually, the more I think about the "irony and awe" equation, the more puzzled I become. What are you talking about???!!! Kraftwerk's "Radioactivity" I can see as both ironic and awe-inspiring. But apart from a band such as Kraftwerk, and a song such as "Radioactivity," I'm not sure if the two can inform the same work of music effectively. What made 88/92 rave/house so great was the lack of irony in the music and scene, which made it anomalous in "hipster" culture . . . .
You never seem to talk about America or American things in your blog. I just can't agree with you about Daft Punk, Dominic. I love them and I don't think I'll get any argument from anyone if I say I'm highly suspicious of irony and meta-pop. 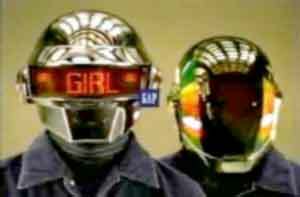 Daft Punk have simply got too much groove, too much simply effervescent joy, to be Ironists pure and simple. And Yello: it's ages since I listened to them, but trust me, there are many swoonsome moments. Check out 'Moon On Ice', a lovely precious sliver of a ballad with guest vocals from Billy Mackenzie. And if you're still unsure about the possibility of irony and awe co-existing, what about my other example, the Pet Shop Boys? All this talk about music is perfectly dandy and splendid, but I do think it is drawing us away from the real doughty and dough-ey issue at hand. You never seem to talk about Slovenia or Slovenian things in your blog. Will be interesting to see what Daft Punk do now. Most big music mags won't even review dance music albums for the time being unless it's to give them scores of 2 or 6.5 or the like. Discovery is pretty much my favourite album ever, although I can appreciate the reasons ppl hate it. Anyway, can they rescue the scene with a brilliant new album or will it make the electrohaters hate like they always do?